While much attention is paid to the literary and artistic contributions of the Yeats brothers, the poet William (1865–1939) and the painter Jack (1871–1957), their sister Elizabeth also played an important role in the Celtic Renaissance, that revitalization of Irish culture that marked the turn of the 20th century. For more than 30 years Elizabeth (1868–1940) toiled with her hands in a printing shop that she christened the Cuala Press (Cuala being an early name for Dublin), publishing Ireland’s best new writers. 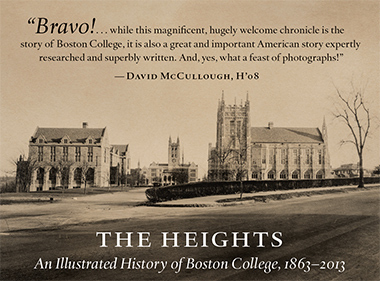 An exhibit at the Burns Library, 60 Years of the Cuala Press, set to open October 23, will showcase Boston College’s extensive collection of Cuala (pronounced COOL-a) artifacts. From the start, the Yeatses were an artistic brood. Family patriarch John Butler Yeats gave up the practice of law in Ireland to pursue a career as a portrait painter, moving his young family to London in 1867 so he could further his studies. In their twenties, Elizabeth and her older sister Lily (1866–1949) studied with the pre-Raphaelite artist and writer William Morris, a central figure in Britain’s arts and crafts movement. Both women also worked to supplement the family’s income: Lily in the embroidery shop of their mentor’s daughter, May Morris, Elizabeth teaching art to kindergartners and writing brushwork manuals for beginning painters. The first of these slim volumes, published in 1895, caught the eye of the fine-printer Emery Walker, who saw in Elizabeth a talent for page design and encouraged her to study at the Women’s Printing Society, begun in 1876 as part of a larger feminist movement to promote skilled employment for women. In 1901, the Yeats family moved to Dublin. There the sisters soon joined Dun Emer Industries, an arts and crafts cooperative—Lily to oversee the embroidery department and Elizabeth to run the printing press. Evelyn Gleeson, the founder and director, was a suffragist who insisted that the cooperative’s work be done exclusively by women. In 1908, long-standing conflicts, both personal and professional, led Elizabeth and Lily to split from Gleeson and from Dun Emer, and the sisters moved to a small cottage in Dublin to form their own business, Cuala Industries. Cuala would be comprised of an embroidery shop and a printing press, staffed exclusively by Irish women. The Cuala Press became distinguished among Irish publishers for specializing in the works of modern writers, including Lady Gregory, John Synge, Katherine Tynan, George Russell, Frank O’Connor, and, of course, the oldest Yeats brother, who would publish 36 books under the Cuala imprint. William would also serve as editor of the press, and it was he who recruited Ireland’s new literary talents while the larger Irish presses were busily reprinting classics. The rest of the Yeats family lent a hand in Cuala’s operations, as well. Jack worked on design and drew illustrations; George, William’s wife, helped Lily run the embroidery department, which produced dresses and linens popular with Ireland’s wealthy. In addition to publishing books, Elizabeth printed Christmas and other holiday cards, calendars, pamphlets, and a periodical called A Broadside, which featured poems, illustrations, and music. After Elizabeth’s death in 1940, George (1892–1968) took up the reins and with the help of several veteran presswomen kept the publishing house in operation until 1946, when she decided to focus on hand-printed cards and gave up the time-consuming production of full-length volumes. The publishing house that Elizabeth sustained for 32 years—a period that saw Ireland’s last struggle for independence from Britain—was ever tenaciously Irish. Even after independence, when Cuala’s financial outlook was dire, Elizabeth refused English patronage. In a letter to William late in her life, she wrote, “We ought to get someone Irish if possible” to pay off Cuala’s bills. But, she complained, “No one here has a father who would put [3,000 pounds] into anything but Guinness.” With only two exceptions, Ezra Pound and Rabindranath Tagore, Cuala’s writers were Irish. And its books were printed on Irish paper.